With the release of the Secret Love compilation series Sonar Kollektiv have succeeded in encapsulating this spirit shared among friends and fans of the label and in delivering a very personal vision of what soul-folk music is. 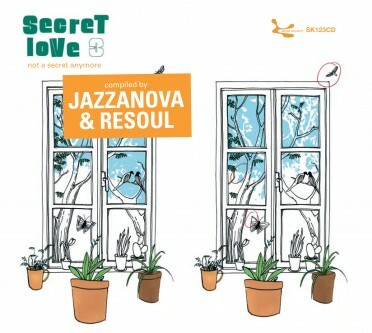 And given the success of the previous volumes of Secret Love with more than 30.000 copies sold, JAZZANOVA faced something of a challenge in putting together this 5th issue in the series. 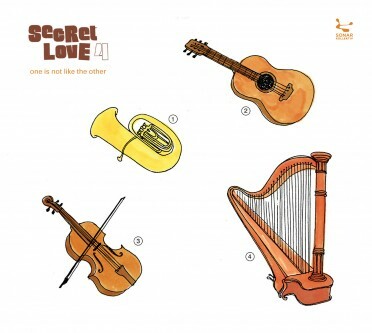 Of course, expectations are high following the acclaim received by the previous four Secret Love compilations. But JAZZANOVA have hit the nail on the head yet again this time with another delightfully diverse compilation rich in some of the best new soul-folk around. Dane NIKOLAJ GRANDJEAN gets the ball rolling with a gentle song appropriately entitled The First Picture. NIKOLAJ who releases on Music For Dreams, shows that all you really need for a great song is guitar and voice. GRANDJEAN is followed up by fellow Scandinavians, CHOIR OF YOUNG BELIEVERS with the somber and heart breaking tune Things I Stole. COYB, who already had the track Riot on the last Secret Love compilation, also released a single this year on Digital Kollektiv (DK023/folkwaves) and their album is hotly anticipated for release on Sonar Kollektiv early 2009. One early highlight on the new Secret Love is BRENT CASH’s The Sea, These Waves which comes from his album How Will I Know I’m Awake (Marina Records). BRENT’s remarkably smooth voice and the easy-listening production is clearly influenced by the sound of BACHARACH, BRIAN WILSON and MCCARTNEY. Broken Promises by QUIET VILLAGE (aka RADIOSLAVE or REKIDS) is an uplifting downbeat number with plenty of soul so it fits the Secret Love bill perfectly. The chilled out track culminates in an ENNIO MORICONE style whistling solo: showdown in QUIET VILLAGE! Deeper Waters by RECLOOSE will soon come out as 12” on SK (SK192/dem roots) and is taken from the album Perfect Timing (SK191CD/illicity) that will be released on SK in September 2008. This divine song features the vocal talents of JOE DUKIE from New Zealand reggae minstrels FAT FREDDYS DROP who already appeared on Secret Love 2 with their song Del Fuego. Love You Straight by POP LEVI is taken from the Never Never Love single on Counter Records. POP LEVI has also released on Ninja Tune and Emperor Norton and Love You Straight is pure romantic pop, reminiscent in production of 70s greats such as E.L.O. or WINGS while his voice has a hint of GILBERT O’SULLIVAN to it. Walking Home is the title track from CROWDPLEASER’s forthcoming EP on Zurich label Drumpoet Community. The melodica on this LEXX 7” version give the piece something of a dub feeling so CROWDPLEASER holds true to his name. Combiner by Danish hip-hop collective BOOM CLAP BACHELORS is taken from their album Kort Før Dine Læber on afore mentioned Music For Dreams. The song was also included on GILLES PETERSON’s compilation Brownswood Bubblers Two and the band played Roskilde festival this year. Secret Love 5 goes from strength to strength with SAVATH & SAVALAS, a mellow Latin/psychedelic side-project of NY/Barcelona based GUILLERMO SCOTT HERREN perhaps better known as PREFUSE73 with notable releases on Warp. Under the SAVATH & SAVALAS moniker he has released on B-Music, Twisted Nerve, Finders Keepers, Hefty as well as on Ninja Tunes. Estrella De Dos Caras is a psyched-out trip that will carry you away on a trance-like journey. Following on from SAVATH & SAVALAS is Sonar Kollektiv recording artist LARS BARTKUHN whose Harmony Of The Spheres is another slightly psychedelic tune and could appeal to fans of TANGERINE DREAM. LARS, who has worked for the prestigious Red Bull Music Academy as a lecturer (Rome) and studio producer (Seattle) released the Dimensions 12” w/ MARKUS WORGULL Remix (SK171/elektrish) on SK earlier this year and a full length album is in the making too, it will be released in September 2008 Sonar Kollektiv. Absynth by WOOLFY VS PROJECTIONS originally came out in 2007 as 12″ on Permanent Vacation. WOOLFY also appeared on the Sonar Kollektiv compilation Computer Incarnations For World Peace 2 (SK185CD/EP) with his track Odyssey. Absynth, a collaboration with PROJECTIONS, is a gently chilled out groove track. The lyrics are sparse but amidst the synths one can discern a voice ask “Is this heaven?…”, it might well be, at least if you’re in love with the secrets of JAZZANOVA’s latest compilation! Next up are THE RUBIES with their hit single I Feel Electric feat Feist. The band is making waves in 2008 with recent support slots for JAMIE LIDELL and WHITEST BOY ALIVE. Their album Explode From The Center came out on Tellé Records (home of ROYKSOPP) last year and I Feel Electric feat. the unmistakable guest vocals by acclaimed Canadian chanteuse FEIST. THIEF is the only artist to be included on all 5 Secret Love compilations to date. As regular Secret Love listeners will know, the group is made up of AXEL and STEFAN from JAZZANOVA (and EXTENDED SPIRIT) and Berlin singer-songwriter SASCHA GOTTSCHALK. The OWUSU remix of Down, Down is a mesmerizing and sublime space-pop number laced with broken beats and intricately cut samples. Which brings us to the penultimate song on Secret Love 5, Song For Wolfie by the ever illusive CLUTCHIE HOPKINS – taken from his album Walking Backwards on Ubiquity Records. This quirky track contains lots of melodica, live percussion and a blues voice like no one other. Its presence on Secret Love 5 is sure to strengthen the CLUTCHIE HOPKINS legend. Last but not least, is Dublin based composer/producer STEE DOWNES who brings this sensational compilation to a harmonious close, fitting as Destruction of Ourselves is in fact STEE DOWNES very first solo release. But it certainly won’t be the last as the track is taken from STEE’s forthcoming debut album All In A Day which is also due for release on SK in November. Destruction of Ourselves is another fine song which rounds off the new episode in the Secret Love story nicely. Secret Love 5 is another high class compilation from Sonar Kollektiv. JAZZANOVA understand the art of selecting a good compilation better than most. So the CD has just the right balance and momentum to make for a fully enjoyable listen from start to finish. From established artists such as FEIST, QUIET VILLAGE, SAVATH & SAVALAS (aka PREFUSE73), POP LEVI, RECLOOSE & JOE DUKIE (of FAT FREDDYS DROP), CROWDPLEASER, THIEF to fresh new talents like CHOIR OF YOUNG BELIEVERS, NIKOLAJ GRANDJEAN, LARS BARTKUHN or STEE DOWNES. JAZZANOVA have done it again with Secret Love 5 on Sonar Kollektiv – it’s a great all round compilation full of surprises and with something for every taste.